The Setter and Pointer club was founded in 1924, sadly any recording of that event has been lost in the ensuing years but suffice to say it was created by people who understood the breeds their working abilities and their breed qualities. From its inception the Club has always been closely associated with the organising and running of Field Trials and that carries through to today with successful trials run in the Spring and Summer in conjunction with the ISAE. 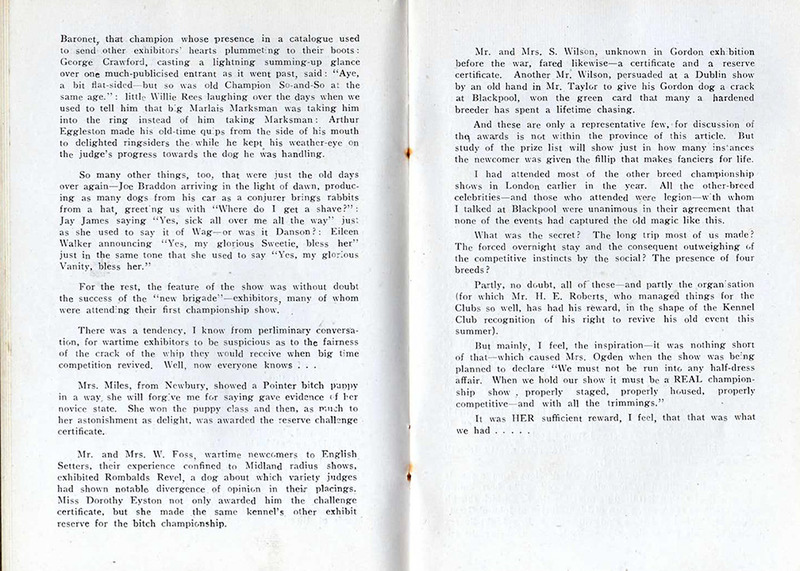 As with a lot of Clubs the Setter & Pointer was struggling in the post-war era but the forward thinking Secretary Mrs M Ogden of the Borrowdale affix and the renowned W.J.Rasbridge who was the Secretary of the ISAE combined forces to create a Championship Show in November 1946. 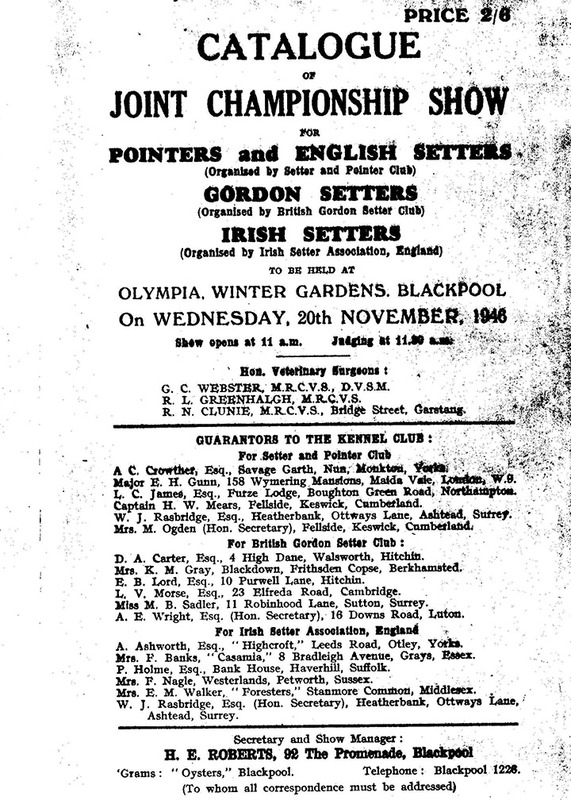 The Setter and Pointer Club was only allocated CC’s for English Setters and Pointers so The British Gordon Setter Club was also approached and all 3 clubs held a combined show at the Winter Gardens Blackpool on Wednesday 20th November 1946. 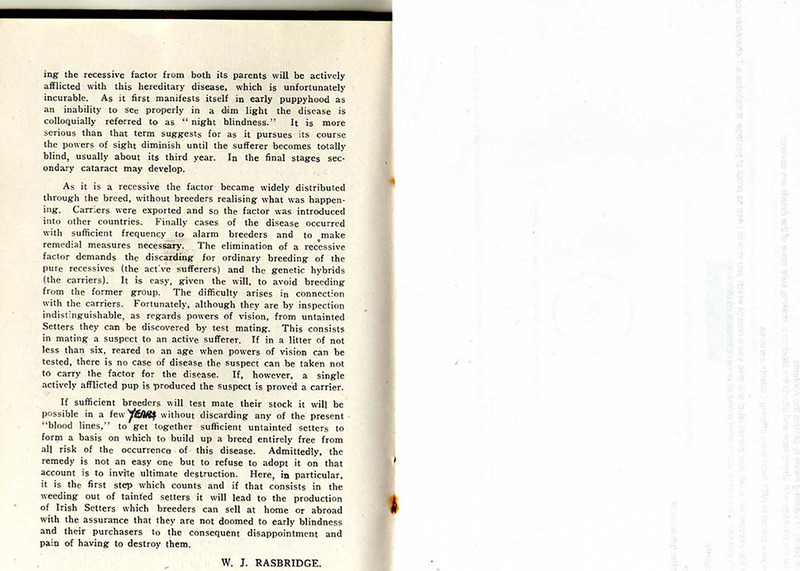 This continued for a few years but the austerity of the post war years took their toll and with low numbers of entries the decision was made to suspend the Championship show and run an annual open show with extensive classification for the 4 breeds. 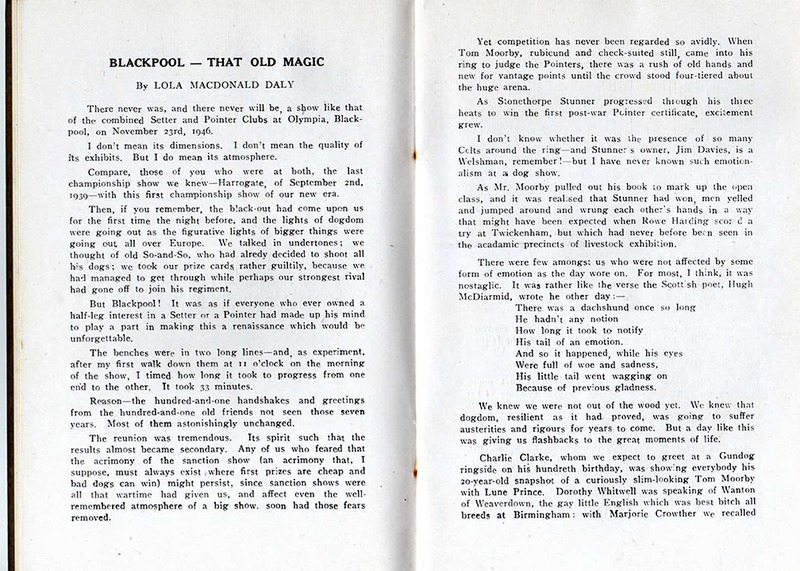 For many years this was held at the Miners Institute in Claycross, I recall sitting around the table with Arthur & Peggy Kelly being regaled by his tales of showing Irish Setters in the 1960’s and one was of the time he was running late and got lost on his way to show at Setter & Pointer. His description of hurtling down country lanes frantically searching for the venue was only surpassed by the telling of the state of his Irish Setter dog who was not a good traveller at the best of times so rattling around the back of the car had done nothing for his digestive system. Arthur found an outside tap, washed the dog off and raced into the ring where much to his amazement he not only won the class but went on to win BOB, can you imagine that happening these days! In the early 1970’s the Club was going from strength to strength so it was decided to try and regain Championship status with the result that in 1975 Setter & Pointer became a Champion Show at the New Bingley Hall Stafford with CC’s for Irish Setters and Pointers and by 1977 all four breeds had Challenge Certificates available. It also had a new Secretary in 1975 in the shape of Geoff Coupe who was the procurer of the Stafford venue and one of the driving forces behind the clubs growth and expansion. 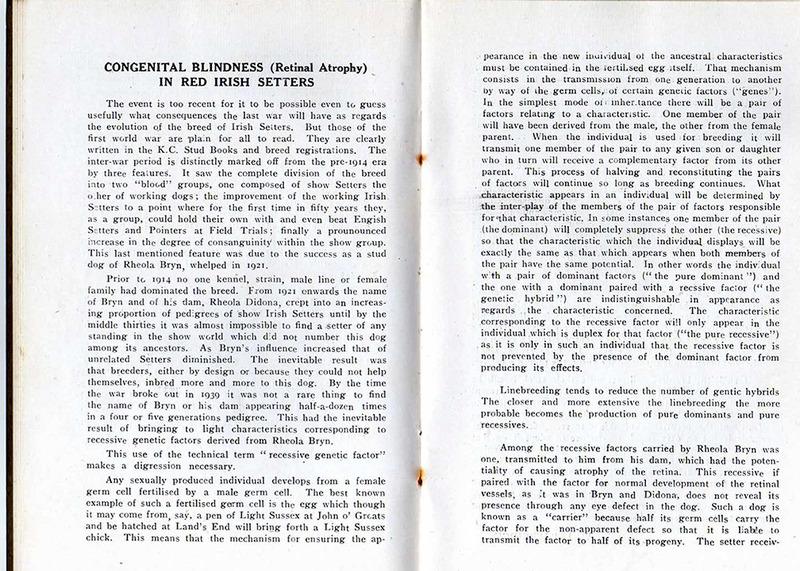 When the Irish Red & White Setter was recognised as a breed by the Kennel Club the Committee quickly added classes for them and 4 became 5, chatting with Geoff recently he regards securing one of the first sets of CC’s for Red & Whites when they were offered by the Kennel Club as one of the highlights of his time in the Secretary seat so in 1988 a full complement of Challenge Certificates were on offer. Looking back through yearbooks the winners of those all-important inaugural CC’s judged by the elegant Mrs Pat Rhodes were DCC & BOB Meudon Amber Glow, BCC Shannonlee Amber Sheen of Hawklawn with the Reserves going to Sir Gayious Sidney (what a great name!) and Copperdale Holly Blue. As with any Club the Setter & Pointer has had its moments of trials and tribulations but it’s quick thinking Committee have managed to keep the ship running smoothly including the time the great L. C. James of Wendover fame had just commenced judging BIS and there was a power cut so all lights went out. The ever resilient Committee quickly adapted to the situation and BIS was judged in the light from a circle of their cars headlamps shining! Geoff stood down from the Secretary post in 2003 after 28 years at the helm but remained on the committee providing assistance wherever it was needed in his indomitable style doing everything from stewarding to ensuring the lights were switched off at the end of the day. He retired from the Committee fully after the 2013 AGM so this being the 90th Anniversary year it was felt his dedication to the club should not be allowed to pass without recognition so a presentation was made at the show as a thanks for all of his hard work. The Setter and Pointer club has held trials since its early beginnings and undertakes the promotion of the working side of setters and pointers. The Setter and Pointer club have a joint field trial sub committee with The Irish Setter Association of England. The current chair person is Richard MacNicol and secretary is Brian Morris. Setter and Pointer trials are held on 4 circuits. In March on grouse held in Northern England and Scotland on heather moorlands, in April in Suffolk on partridge and pheasant on spring wheat and corn, the summer grouse circuit held in England and Scotland on heather moorland and then a week in September on stubble, the quarry being partridge and pheasant. The Club hosts field trial classes at its championship show, and hopes from 2015 to also host working gundog classes. The Committee are delighted to be celebrating the 90th Anniversary of Setter & Pointer Club and share those celebrations with the exhibitors who have made the show what it is today. We hope to keep you up to date with club events via Facebook and look forward to seeing you at future shows and field trials.